When is comes to choosing the right media card for the Nikon D7100, you may wonder if it is worth paying more for a fast card. Take an in-depth look at the available choices and see how the D7100 benefits by using the fastest cards available. If you ever shoot a burst of photos, such as when photographing wildlife, a sporting event or an unpredictable event like children playing, then a high-speed card should be used in your Nikon D7100. With the new camera’s 24 megapixel resolution, fast write speeds are more important than ever before. The D7100 is a high-end consumer camera. Nikon calls it an “enthusiast” camera, even referring to it as a “DX flagship.” Although it falls just short of professional grade, it is perfectly capable of professional results. One area where the “consumer” bit shines through is its buffer size. Consider a professional camera such as the D4. Fully optimized for speed, its buffer size is times larger than the D7100 and it uses the latest technology in XQD media for blazing write speeds allowing one to shoot up to 100 RAW photos continuously at 11 frames per second. The D7100 can hold only 6 RAW frames in its buffer before it has to write data to the SD card at which point it slows down and is limited by the card’s write speed. If you feel shortchanged by the small buffer, consider that the D4 would set you back $5,999, while the D7100 is a relative bargain at $1,199. When it comes to SD cards, there a few terms you may see. Class is a relative gauge of minimum speed at which card is capable of reading and writing. Classes 2, 4, 6 and 10 are defined as minimum performance of 2, 4, 6 and 10 megabytes per second (MB/s) read and write. Today all these speeds are considered slow and any card you consider buying for the D7100 should be capable of Class 10. There are no defined classes beyond Class 10. Another term you sometimes see is a X rating, such as 600X. Lexar commonly uses these designations on their cards. The base measurement is the standard of CD-ROM 150 kilobytes per second (kB/s) which is 0.15MB/s. A 400X card can read and write at 60MB/s, while a 600X card is 90MB/s. One term you should pay attention to is Ultra High Speed (UHS) speed class. Currently the fastest cards available are UHS-I (also written UHS-1). Cards capable of UHS-I are able to transfer up to 50MB/s and recent variant of UHS-I called SDR104 allows speeds up to 104MB/s. SDR104 cards are still labeled UHS-I so you need to look at the actual speed designation on the card on the card or published by the manufacturer to know the maximum speed. These numbers are theoretical maximums, actual card performance may be slightly lower. Often the write speed of a card may be lower than the read speed. The Nikon D7100 is capable of UHS-1 including UHS104. Nikon has stated the D7100 can achieve a write speed of up to 99MB/s. You will see cards labeled as Secure Digital (SD), High-capacity (SDHC) and extended-capacity (SDXC). These designations refer to the capacity of the card, with SD up to 4GB, SDHC from 4GB up to 32GB and SDXC greater than 32GB. You do not need to worry about this designation, all types are compatible with the Nikon D7100. When shopping for SD cards for your D7100, look at the speed rating label in MB/s, such as 35MB/s, 45MB/s, 90MB/s or 95MB/s. These numbers are easy to compare, and are directly relevant to shooting performance because you will be shooting pictures with a relatively known file size. For example, when shooting RAW files 14-bit lossless compressed, your files will be around 29MB each. If your card is capable of write speeds of 35MB/s you could only write about one frame each second after the buffer is full, while a 90MB/s card operating at maximum speed could write up to 3 files per second. These are theoretical numbers, in real world tests cards are slightly slower. Notes: Data adapted from Nikon. File sizes and buffer capacities are approximate. File size varies with image content. JPEG mode set for size priority. Use of optimal quality JPEG compression, HI ISO settings, long exposure noise reduction and auto distortion control will decrease buffer. When shooting RAW (.NEF), you can take between 6 to 9 shots (depending on RAW mode) until the buffer is full. In terms of time, this could be just one second! Your shooting will then slow down depending on the write speed of the SD card. The fastest card avaialble, Sandisk Extreme Pro 95MB/s will be able to continue at up to 3 fps, whereas a slower card capably of 35MB/s could only shoot at about 1 fps beyond than point. The size of the SD card is entirely up to you. Some photographers prefer shooting on smaller cards to keep projects separate and to mitigate the amount of data loss if a card is damaged or lost. Because the D7100 has two slots, you can back up your images automatically. If you set the D7100 to automatically write to both card slots, use a high speed card in both slots because the slowest card will be the limiting factor. Many select 32GB or 64GB capacity cards for the D7100. When shooting lossless compressed 14-bit RAW (.NEF), the D7100 can hold about 1,000 images on a 32GB card. A 64GB could hold twice as many. Fastest Cards (95MB/s read 90MB/s write): Choose if continuous shooting is most important. Slower Cards (45-60MB/s write speed): Choose when speed is less important, or for budget reasons. * Write Speed. Lexar SD card write speed is significantly lower. 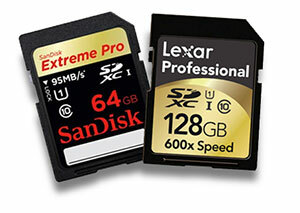 High Capacity Cards: Choose for extended shooting and video. For more information see Fastest SD cards for Nikon D7100. The Camera Memory Speed site tested many SD cards in the D7100 and published a detailed report. This entry was posted in Instruction Manual, Nikon D7100, SD Cards on March 29, 2013 by D7100 Admin.